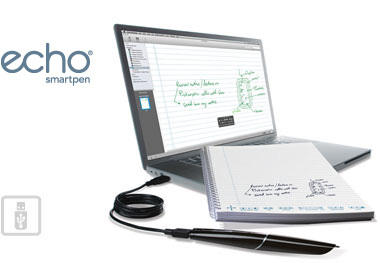 SmartpenCentral offers the full range of Livescribe products for its customers across Canada and around the world. We typically ship on the same business day and we pride ourselves on the quality of our work. Whether you are looking for a smartpen, paper product, ink or other accessories, we hope that you will choose to make SmartpenCentral your primary supplier of Livescribe products! What starts on paper, doesn't have to stay there. Livescribe smartpens bring your words and ideas into your digital world. Echo connects easily to your laptop or desktop by USB cable to transfer your interactive notes. Search, organize and share replay your notes with Echo Desktop. The 1.3 oz. Echo™ smartpen records audio and links it to what you write. The 2GB of memory can retain up to 200 hours of audio. Actual recording time varies by audio quality setting. Requires Windows XP™ 32-bit SP2 or higher, Windows Vista™ 32- or 64-bit, Windows 7™ 32- or 64-bit operating system, or Intel Mac with Mac OS X 10.5.5 or newer. Mufti-lingual packaging. The Aegir Smartpen,Marlin Edition, Purple Colour Smartpen is designed with the meticulous attention ­to ­detail that a premium writing instrument deserves. From the integrated stylus cap, down to the Swiss-­made tungsten-­carbide ballpoint ink cartridge, we've paid close attention to deliver an experience that is worthy of the title of your new favorite pen. But it is the amazing amount of technology packed inside the Aegir Smartpen, Marlin Edition, Teal Colour that really delivers the magic. Once you remove the cap to expose the ink cartridge, everything you write is captured by the infrared camera on the pen and stored on the Smartpen’s built-in memory. Simply connect your Smartpen to your iOS or Android device and watch as all your notes are synced to the Livescribe+ mobile app. The Aegir Smartpen, Marlin Edition, Teal Colour Smartpen is designed with the meticulous attention ­to ­detail that a premium writing instrument deserves. From the integrated stylus cap, down to the Swiss-­made tungsten-­carbide ballpoint ink cartridge, we've paid close attention to deliver an experience that is worthy of the title of your new favorite pen. But it is the amazing amount of technology packed inside the Aegir Smartpen,Marlin Edition, Teal Colour that really delivers the magic. Once you remove the cap to expose the ink cartridge, everything you write is captured by the infrared camera on the pen and stored on the Smartpen’s built-in memory. Simply connect your Smartpen to your iOS or Android device and watch as all your notes are synced to the Livescribe+ mobile app. The Livescribe Aegir Smartpen, Dolphin Edition, Purple Colour is the perfect bridge between your analogue handwritten notes and your mobile digital device! The Aegir Smartpen, Dolphin Edition, Purple Colour Smartpen is designed with the meticulous attention ­to ­detail that a premium writing instrument deserves. From the integrated stylus cap, down to the Swiss-­made tungsten-­carbide ballpoint ink cartridge, we've paid close attention to deliver an experience that is worthy of the title of your new favorite pen. But it is the amazing amount of technology packed inside the Aegir Smartpen, Dolphin Edition, Teal Colour that really delivers the magic. Once you remove the cap to expose the ink cartridge, everything you write is captured by the infrared camera on the pen and stored on the Smartpen’s built-in memory. Simply connect your Smartpen to your iOS or Android device and watch as all your notes are synced to the Livescribe+ mobile app. The Livescribe Aegir Smartpen, Dolphin Edition, Teal Colour is the perfect bridge between your analogue handwritten notes and your mobile digital device! Send your handwritten notes directly from Livescribe Desktop to MyScript for Livescribe for conversion to text. Convert handwriting, shapes, drawings and tables into print. Edited results can be sent to Microsoft Word or other word processor, to a text file, to your default email application or saved as a picture file. Select the notes that you want to convert and click the "T" button. In the menu that opens, choose the page you wish to convert and then choose "With Myscript" in the second menu. An APX-00034 in an APX-00032 box. The Livescribe Aegir Smartpen, Dolphin Edition, Purple Colour is the perfect bridge between your analogue handwritten notes and your mobile digital device! With an embossed cover the Livescribe Notebook by Moleskine is elegantly designed to inspire thoughts and ideas. Featuring center-stitched binding to ensure it always lies flat, the notebooks also include iconic Moleskine design details, from the familiar rounded corners, ivory-colored pages and ribbon bookmark to the elastic closure and the “In case of loss…” label printed on the flyleaf. Made from acid-free paper, the notebook provides an enjoyable and smooth writing experience that is the perfect bridge between the analog and digital. On each page, printed Livescribe 3 controls enable quick access to Livescribe+ features. Included in the notebook’s back pocket are 2 bookmarks that include the full set of controls for each Livescribe smartpen. The Livescribe Notebooks by Moleskine are available in #1 and #2 series and work with all Livescribe smartpens but does not necessarily fit all the available portfolio cases. Livescribe Sound Stickers are small stickers for recording and playing back audio notes. Enhance any project with your own recorded audio. 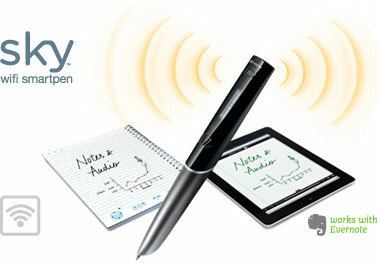 In the past, Livescribe Sound Stickers were compatible only with Echo smartpens. With an upgrade to firmware, it is now also possible to employ Sound Stickers with Sky smartpens as well (see Tech Specs for details). Sound Stickers are NOT compatible with the new Livescribe 3 smartpens.